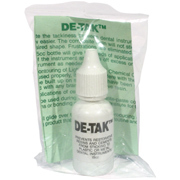 De-Tak™ is formulated to eliminate the tackiness between dental instruments and filled composite resins. Placement and contouring are now easier. The composite resin will not stick to the instrument, be it metal or plastic, and pull away from its desired shape. Frustrations are eliminated. Use De-Tak™ for placement and contouring of Light Cured and Chemical Cured (paste-paste) composites, micro-fill and hybrid resins. When used properly, it will not interfere with the setting, chemical or physical properties of the resin. Resins can be built up on surfaces that have been contoured with a De-Tak™ coated instrument. 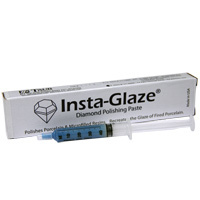 De-Tak™ can be used with any brand of restorative resin. De-Tak™ is also desirable for applications of cements. With De-Tak™ your instrument will glide over the resin surface producing a smoothly contoured area. It is an easy to use, simple and time saving product that should become a routine and necessary procedure in your office. 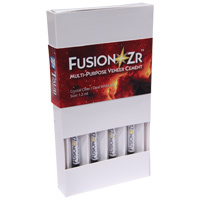 FUSION-Zr™ is a self-adhesive, light cure veneer cement and is indicated for the adhesive cementation of all-ceramic restorations, Zirconia, Lithium Disilicate and CAD/CAM type materials, where light curing is desired. - Use instead of rubber polishing wheels. 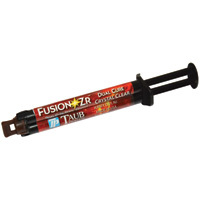 FUSION-Zr™ Dual Cure Resin Cement. For permanent cementation of all-ceramic restorations, zirconia, CAD/CAM materials, veneers, crown & bridge, inlays/onlays, PFM, posts/fiber posts.